Stainless steel may still be ‘King of the Kitchen’, but there are encouraging new signs that its time may be fleeting. Whirlpool turned more than a few heads last week when they announced a new finish for their deluxe kitchen appliance collection… White Ice. White Ice is a mirrored-glass over white and silver accented design. It’s caught the industry by surprise because this is the first time in at least a decade, the exterior finish of a major-brand high end appliance line isn’t strictly stainless steel. Fig 1 – Whirlpool’s White Ice Collection showcased in House Beautiful’s 5th Annual Kitchen of the Year at Rockefeller Plaza last week. Image courtesy of Whirlpool. The ‘back to the future’ inspiration for White Ice is fairly obvious. This high-touch surface is at once retro – reminiscent of old enameled white appliances from our childhood, and futuristic – with obvious borrowing of Apple design sensibilities. The White Ice refrigerator looks like it could have been penned by Jonathan Ive himself. It’s surprising the doors don’t have magnetic pockets for your new white iPad 2. Of course that would be just too literal… destroying any pretense of subtlety or metaphor. I’ve never really been a fan of stainless steel and the industrial (low tech) commercial kitchen appliances in the home. I’ve worked in too many restaurants, and stainless steel is not fun to clean. It also costs a lot more.. often $500 or more than any other finish. I really think Whirlpool is onto something here with its more refined high-tech/high touch approach to appliances. Modern refrigerators are sophisticated machines, and the harmony-of-perception (i.e., the surface matching the internals) is a welcome change. This design harmony also lends itself to more sophisticated motifs in kitchen design. Consider the beautiful high-tech ovens and ranges now available from Europe. 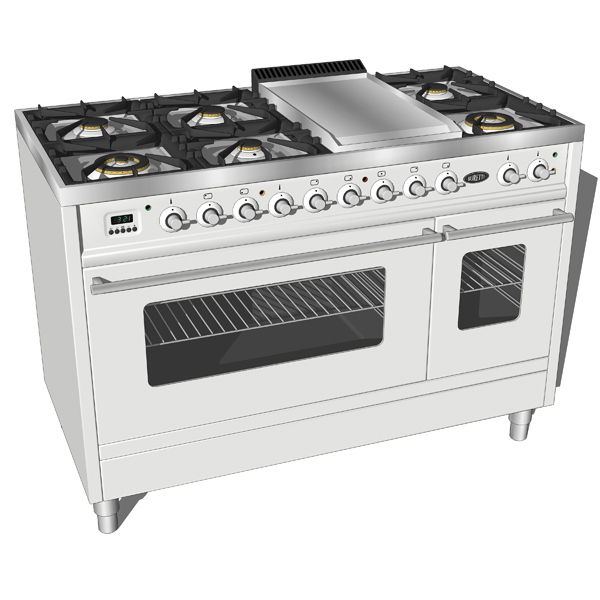 Induction ranges available from Bertazoni and Boretti (below) will pair beautifully with White Ice. Fig 1- Low Poly and High Tech – 3D Model of the Boretti VFP 120 Stove – 3D models of contemporary European kitchen appliances available on FormFonts.com. Fig 3 – 3D model of contemporary Integra Kitchen set – FormFonts 3D Models. Rather than slavishly matching stainless steel appliances with granite tops and dark cabinets to boost resale value later, design harmony from ‘high tech’ motifs will enable interior designers to create comfortable living spaces right now. In short – ‘Design for resale’ , ‘stainless steel’ and the ‘cooks kitchen’ are all dead. Huzzah! Long live the kitchen-as-liveable space that becomes part our everyday life. Chew on that Paula Deen! This entry was posted in 3D Models, Interior Design, Trend Textures, Uncategorized and tagged Apple design, appliance finishes, Bertazoni, Boretti, Diabetes, high end appliances, high tech kitchens, Induction ranges, Interior Design motifs, Jonathan Ive, Kitchen design, Kitchen Trends, Novo Nordisk, Paula Deen, Stainless Steel, Stainless Steel cookware, Whirlpool, White Ice. Bookmark the permalink.